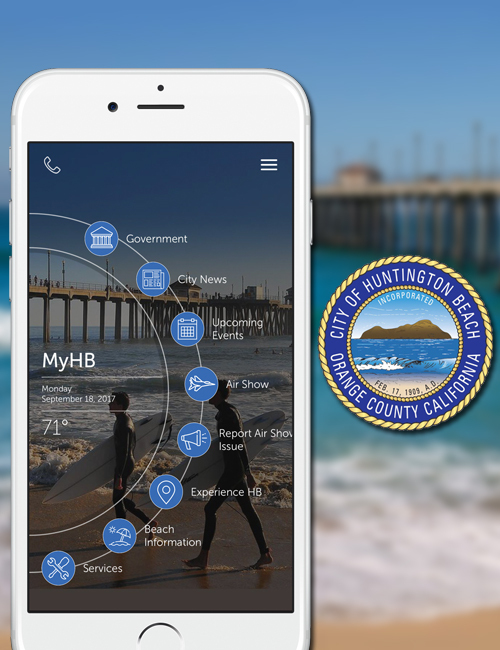 Huntington Beach is the latest city to engage their citizens like never before with their MyHB mobile app. City officials found that 40% of traffic to the city’s website was from mobile devices. Now with features like Government, Beach Information, Experience HB, City News, Upcoming Events, and Services, citizens will find it easier than ever to stay connected with their city with just a few taps on their mobile device. Residents and visitors alike can now find information about facilities, libraries, points-of-interest and the over 100 parks, along with information, phone numbers, maps and directions, as well as have access to city council agendas. They can stay informed and up-to-date on the latest happenings and upcoming events through the City News and Upcoming Events sections. The status of requested permits can be checked in the app using the permit number, APN or property address. Beach Info is one of the most visited tabs on the city’s website. Now surfers and beach goers can find out beach conditions with a few taps in the mobile app. Beach and surf conditions supplied by Surfline are fed into the app daily at 7:05am. Additional features and functions will periodically be added. Each month, the city will feature a special tab to highlight an event or service that is unique to that particular month. Dynamic information will be time sensitive and ever-changing as events come and go. The first such event will be the city’s upcoming airshow. The app is launching with functionality to promote the airshow, providing all pertinent event information and including an FAQ section. Also available, will be parking information, and Uber and Lyft drop-off and pick-up locations. Citizens will be able to report issues and incidents relating to the airshow that will be received, tracked, and resolved by police and city officials, dependant upon issue type. The data collected will be valuable not only to handle the issues as they are reported but to improve upon citizen experience for all future events. Keep an eye out for the ability to Report an Issue through the app, as the city plans to replace their current issue reporting provider with the MyCivic RAI after the new year.